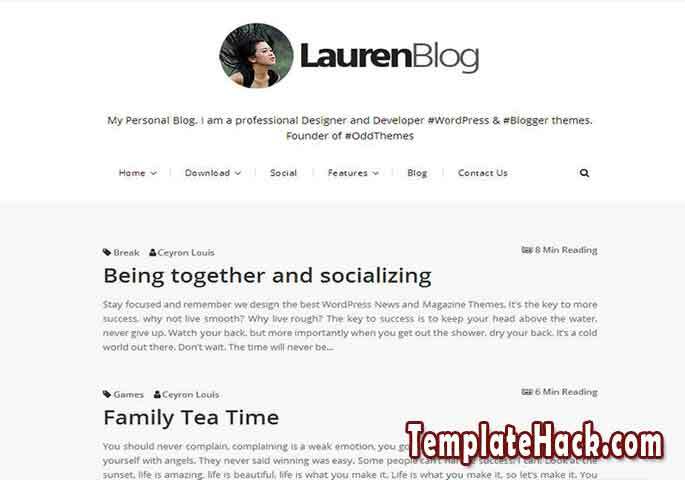 TemplateHack.com - Download Lauren Blog premium blogger template. Lauren blog is very simple blogger template made by OddThemes. This template just has text only design, don’t have any post thumbnails exepct image on blog title. Because of that, Lauren come to very fast loading blogspot template. You can check this blog speed manually on GTMetrix or Google PageSpeed Insights and you’ll shocked about this blog speed. Lauren Blog is very recommended template for SEO, for internet marketing and digital marketing. Browser Compatibility, Customizable, Drop Down Menu, Fast Loading, High CTR, HTML5 Valid, Mobile Friendly, Page Navigation Menu, Responsive, Search Box Button, SEO Friendly, Whatsapp Sharing Button, Whatsapp Sharing Button, Clean, Minimalist, Simple, No Sidebar, White, 1 Column, No Column Footer. Beauty blogger template, Daily Blog blogger template, Fashion blogger template, Lifestyle blogger template, Magazine blogger template, News blogger template, Newspaper blogger template, OOTD blogger template, Personal blogger template, Recipes blogger template, Reviews blogger template, Travel blogger template, Technology blogger template, Viral blogger template.